Last Monday Andy Raskin, a storyteller in Beth Lisick's Porchlight series (this month's theme: Busted! ), was telling a tale that turned on a rumor circulating in Japan in the mid-1980s. American intestines are 1.5 times longer than Japanese intestines: that's how the rumor went. It had to do with eating and digesting our muscular and chewy American cows and the inability of the average Japanese person to do so in the middle 1980s. Perhaps Japan wasn't importing enough beef during the Reagan administration. Maybe it was the basis for a car ad in which Carrot Top ate an entire Toyota truck, synthetic upholstery, rubber floor mats, and all. Perhaps it was a prescient explanation for Bush Sr.'s 1992 breach of etiquette, that indelicate sushi incident: his extra long intestines literally gagged the poor man. 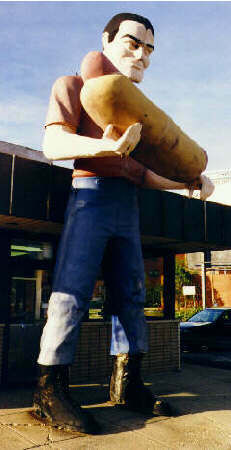 In fact, if the rumor persisted into the new millenium, it likely threw off the betting at the Nathan's Hot Dog eating contest. Wasn't Takeru Kobayashi victorious again this year? Maybe his intestines are on par with Lance Armstrong's reported extra-large heart. And what kind of doping can put you in front of the pack? "We found Pepcid AC in his urine!" But still. Kobayashi's victory presents pretty substantial evidence that the rumor's been quashed. But don't ask me what this intestines rumor had to do with Porchlight's Busted! theme. I couldn't tell you. I was distracted. Distracted! Did Mr. Raskin -- who is surely a creative man -- make this rumor up? It'd be so easy to make up something like this. Not the part about the actual length of brawny American intestines, per se, but rather the bit about it being a rumor in Japan. It'd be simple to just fabricate something like that. Who'd know? I couldn't stop thinking about it, even as the audience chuckled at the further twists and turns of Mr. Raskin's tale. Is this intestine length stuff a real rumor, or just a rumored rumor? If the answer isn't in Wikipedia or listed on Snopes, how would you even find out? It just so happens that Snopes regards intestine length as one of those great unanswerable questions. And surely the rumor's implicit racism would violate Wikipedia's fair and balanced dictum. Nothing fair and balanced about insulting an entire nation's digestive tract. Nothing at all! Happily, my Lunch co-editor is up on all things Japanese, so I was able to ask him: is there any truth to the rumor that there used to be a rumor about Japanese intestines? Yes, he informed me, there was. As one would suspect, it's died out by now; thus Mr. Kobayashi's stunning winning streak did not seriously undermine anyone's worldview. But what would've happened if my co-editor hadn't dropped by? Where would I be then? In my living room, looking at Yahoo Answers, that's where! I'd drop right in to the "Society and Culture" category and have a look. Someone else must've wondered this too. When it comes to important questions about intestines, my fellow Americans seem to exhibit limitless curiousity. In fact, maybe the answer's lurking in the subcategory about culture and groups. I really like him and I don't wanna lose him because he's the only other gay goth guy at my school, but I don't like feeling pressured to do something that I'm not ready to do yet. The only other gay goth guy at my school? Not even close! Where does a girl go to find out about cultural interpretations of intestine length? Surely a search on "intestines" will reveal all that I seek. Ah, quite a number of resolved questions about intestine length. Maybe one of them'll hold the key. Q: What is the length of your intestines? 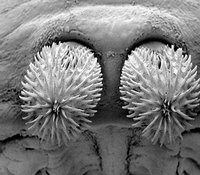 Together - the intestines range in length anywhere from 25 - 31 feet. The expert was a lovely young girl whose profile included a photo. Her response was very earnest and very accurate. I suspect she even added small intestine length + large intestine length on her own initiative as a hedge against the accusation "you didn't answer my question!" Lucky for me the answer-a-thon doesn't end there. Someone apparently didn't believe our last expert. Q: Is it true that your intestines are 26 miles long? A: According to the slithery sites in our Digestive System category, we have about thirty feet of intestines in our body! The small intestine, where most of the digesting happens, is over twenty-two feet long! ... 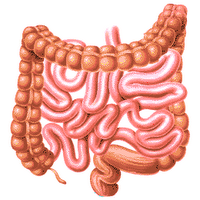 The large intestine, or colon, is about six feet long. Q: How long are the human intestines? Ah, a leitmotif of death with a hint of Eurotrash influence hidden in the introduction of metric units. That'll keep 'em coming, death and metric. But I'm still lost with regard to the authority of my rumor about a rumor about intestines. My query has yielded 2258 results. Turns out EVERYBODY on Yahoo Answers just loves intestines. Intestines and tapeworms. Intestines and herbivores versus intestines and carnivores. Frog dissections and intestines. Snickers bar digestion and intestines. Yep. There's a lot to know about intestines. Perhaps the truthiest vital organ, intestines. But I'm gonna have to ask it myself if I want to know about this rumor. Interestingly, a quick tour of search results on intestines japan length rumor beef yields a pointer to a sinophile blog in which Japanese intestines are rumored to be longer, not shorter. I might be happier asking more practical questions. 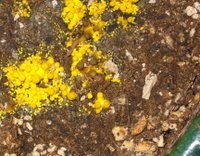 For example, that yellow fungus -- the one that had me so worked up last week -- seems to be spreading. It's moved to the south easternmost corner of the house, to the rubber tree's pot. 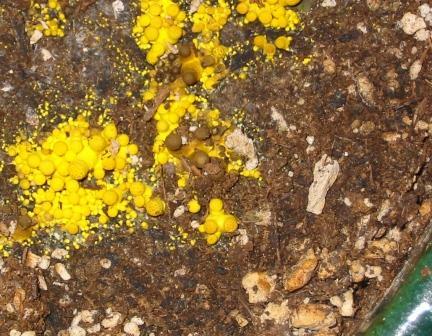 The fruiting bodies (mushroom speak for "mushrooms") look a little different, but they're still BRIGHT YELLOW. 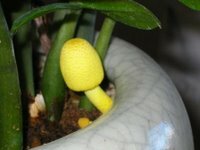 What does Yahoo Answers have to say about bright yellow indoor fungi? Sure enough, I'm not the only one afflicted. What I've discovered is that not only do other people -- chi chi, joanna g., and Sage T -- have yellow fungus abloom in their houseplant soil, but also that Yahoo's self-appointed experts also have no idea what they are either. But I no longer feel so alone. One more question before I decide that Yahoo Answers is even less truthy than Wikipedia. This one's consequential: "Is that poison oak I see beside the trail?" I ask as I stray from the path to harvest some ripe berries. 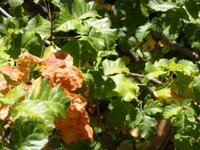 Poison oak or not? Yahoo Answers tells me, "The poison oak will be growing from a vine and the oak seedlings will be from a straight stem. Wear protective clothing and try to uncover the base to determine. After a while you will be able to tell one from the other by sight." The answers that tell you how to identify a horrible itchy weeping disfiguring rash are more definitive. I'm beginning to see the virtue in Wikipedia for the first time. Interesting that there's a lockdown on Elephants though. Would it be disingenuous to wonder why that happened?